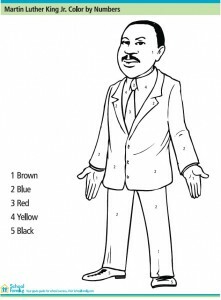 Celebrate and teach children about the accomplishments of Martin Luther King, Jr. (MLK) using this free printable color by number worksheet as a supplemental activity. The Martin Luther King Jr. color by number activity was created by our friends at SchoolFamily.com and they invited us to share the printable with our readers. You can find more educational resources at the SchoolFamily.com website.